Organic carrot: known as a good-looking asset thanks to its richness in beta-carotene, it unifies the complexion and revitalizes the tired skin. Ideal for dull complexions lacking radiance. Organic Grapefruit: with purifying and toning properties, it refines skin texture and tightens pores. Perfect to have a smooth and glowing skin. This illuminating mask is made of biodegradable and organic cotton. Easy to use, it is very pleasant to apply. Bring radiance and light to your complexion with the Pulpe de Vie Margar'Eclat Organic Glow & Energy Facial Face Mask. An essential cosmetic to have in your bathroom! 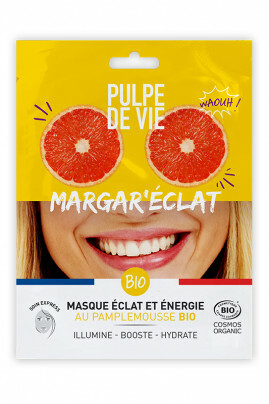 How to use Pulpe de Vie Margar'Eclat Organic Glow & Energy Facial Face Mask! After laying it down, place the mask on your cleansed and dried face, taking into account the holes specifically cut for the nose, eyes and mouth. Remove the mask and massage the excess product or rinse with clean water. For a reinforced effect, we advise you to use in addition the shine and energy range Pulp of Life as the Organic Moisturizing Face Serum or the Organic Shine Light Care. A face mask in organic cotton with natural assets!